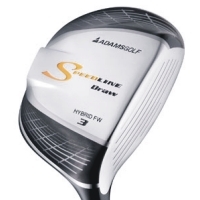 It's about the playability of a hybrid and the distance of a fairway wood with the new Speedline Hybrid-Fairway Wood. This new generation features the Boxer Technology design that increases MOI for added forgiveness. And with more efficient launch conditions and higher ball speeds compared to standard fairway woods, more distance is a reality.